Late last night I typed up an artist statement for my piece in the upcoming Ocean Grove show. As the piece is almost 20 years old, I know it well, so this was not difficult to write up. Sent a copy by e-mail to the show organizer, and told her I bring a hard copy today. In the morning I added a title and my name to that statement and printed it out. Got to the Studio in the afternoon, dropped off the statement in the office, then headed downstairs to continue my block. Today I started cutting some areas within the architecture, doing most of the tower, and starting work on the semi-circular apse in the foreground. 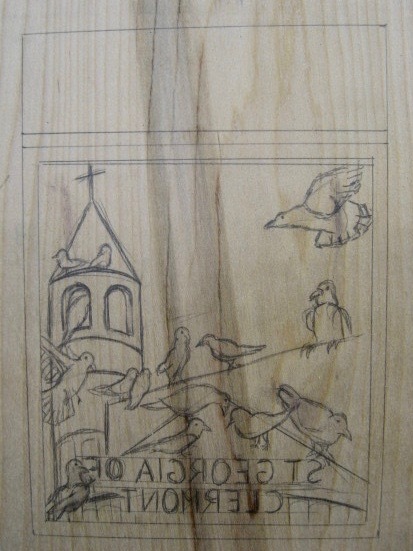 More birds have been outlined, but I still haven't cut within any of them yet. I ended up stopping because I realized I still hadn't resolved all the architectural drawing in these areas, and decided I should do that before I cut any more. There will always be more time tomorrow. 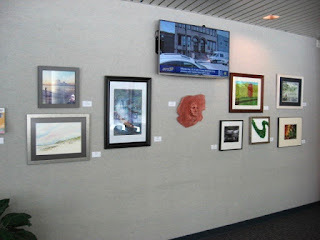 Each time that I participated in the WinterFest, I was given a whole small wall to fill, right down on the first floor. The walls on that floor are already filled and no sign of mine, so I asked the organizer yesterday what the plans for my piece are. She said that she was still working things out, but was leaning toward having it up on the 3rd floor by the yoga studios, adding that it's a busy part of the building, so lots of people will see my piece. So after I was done cleaning up, I took my stuff to my car, then took the elevator up to the top floor. Somewhat disorganized still- some things on walls, some empty walls, lots of tools, ladders, etc. However, it was true, a lot of people around, especially kids, on a floor that was still closed to the public a few years ago, so maybe this will work out ok. Not quite as easy to visit as the 1st floor, but we now have multiple stairways, plus a working elevator, and enough stuff going on to lure people up there. The opening will be Sunday, June 4th, 3 to 6 pm. I arrived at the Studio to see a rare Molly sighting, but she was on her way out. Also ran into Jackie at the building's front door, but she came back a little later. As I was cutting she was doing something at the sink, but then had a problem and called me over. Couldn't get the water to shut off. The faucet is doing nothing right now. 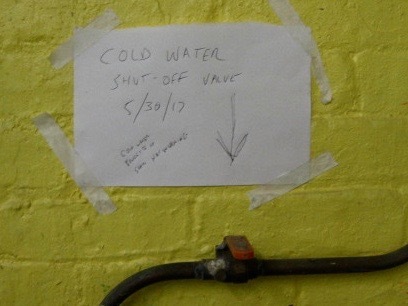 Short term solution was to use a shut off valve to stop the water from reaching the sink, but that's not a good long term solution. Told Herb about it and he complained about all of us. Maybe he'll get it fixed, maybe not. Meanwhile I called a left Molly a message so she's know about it. Early in my Studio visit I dropped off the paperwork for the upcoming show. I received a few postcards, which tell me that the opening reception will be Sunday afternoon, and I believe there will be some refreshments. 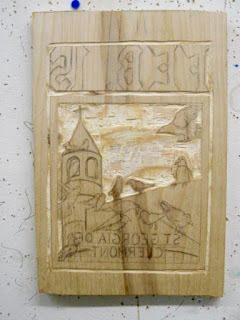 My main task today was starting the carving of the new block. Since I am planning to use this piece as my entry in a bird themed show, I have a deadline to meet, two weeks from Friday. 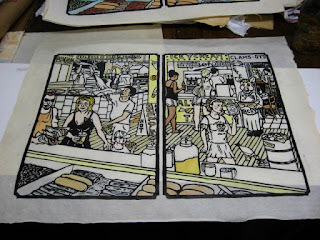 Leading up to my MFA show, I was regularly producing one whole block per day, so I'm not worried. Finished cutting out all the sky today, and I'll be back for more tomorrow. Once in a while watching 60 Minutes leads to thoughts of art. Back when I was still in the midwest, they did a piece destroying Thomas Kinkade and his fans, causing one of my old friends to call me up and ask me what I knew about the guy. Tonight there was a story about a guy who has made a lot of money in his business, but is plowing that money into space research, specifically the idea of structures that can be inflated in space. Small and lightweight for transporting, but able to become large contained spaces. Apparently it had been a NASA concept, but never got fully realized and the funding got cut, and this guy decided to run with it. Experiments still going on, but looking promising. 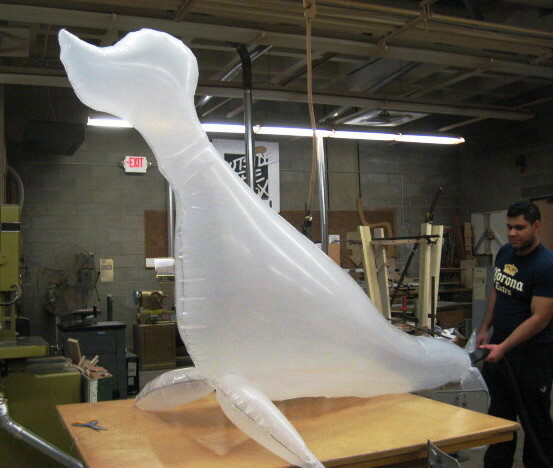 So naturally my thoughts were drawn to the inflatable project I do with my 3D classes, as in these student examples. 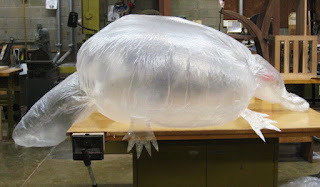 Made from drop cloths and plastic sealing tape, these are not space worthy, but still require planning and execution, a good way of summing up skills learned in the class and most students succeed with the project. For years the only practical use for the skill that I could think to share with them was creating balloons for the Macy's Thanksgiving parade, but now I can tell them of a second career opportunity. As with the parade, better quality materials would be needed, but if you can figure out how to make things like this, you can figure out other 3D objects. I had not an opportunity to stop by an art supply store the past few days, and I didn't want to drive to one just for a single tube of watercolor paint, so I decided to see if I could manage with what I had in stock. Had a small tube of white, and a broken half tube of completely dried black. Dried watercolor paints are not as convenient to use as liquid paints squeezed from a tube, but they can still be used. In fact, most of the watercolors I used in coloring these pieces were dried mixes of common colors of my palette. It's just harder to mix, but I needed a bunch of grays so I got to work. The main thing I had left for today was a bunch of grays- the ice cream machines in the back, the pizza ovens in the back of the other corner, and the sausage and peppers grill in the foreground, plus some other minor things. Took a few hours, but it's all done now. 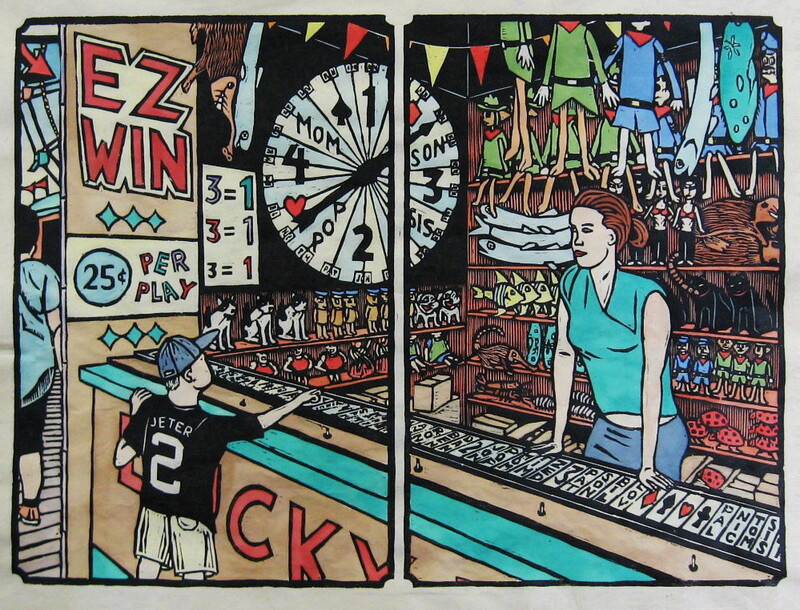 Below are the two boardwalk prints that I pulled and colored specifically for this purchase. I'll give them one last look next week, then sign and stamp them and pack them until my customer is ready to pick them up. At one point she had been talking about coming back to the Shore for a spring visit, but that never happened. And despite the fun to be enjoyed on the boardwalk in summer, the crowds and hassles keep me from recommending it to visitors. Some days the art life is a lot of driving around, dropping off things, picking up things. Got in some of each today. The past two years the building where the Studio is held a WinterArts festival, celebrating the artists who work in the building, while also trying to lure people in during the bleak winter season. Each time a week's worth of events, and the show remained up for months. Of course, the down side of a winter art festival is dealing with the weather, and each of those past winters we had a lot of snow, ice, and freezing temperatures that kept it from melting, which may have cut into attendance during these events. Perhaps that's why they skipped the event this year, though as it turned out this was the least snowy winter in quite a few years. (I'm not complaining) In the spring it was announced that there would be something different, a show called "This Great Earth", with a nature theme. Not something I have done much in my career, so I figured I'd skip it, but when I was in the building earlier this week I was begged to submit something. Looked around when I got home and realized I did have one suitable thing available. 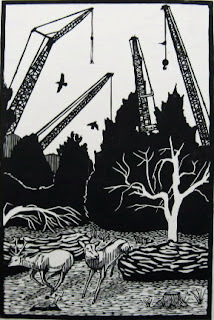 Back around 2000 I produce two prints for a themed show at the Print Council called "Preserving the Garden", which celebrated our then governor's decision to preserve from development half of the untouched land left in New Jersey. 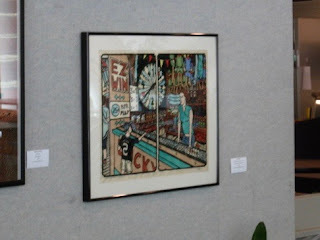 The piece shown above is one of those pieces. Called Moving Day, a simple portrayal of the effect of rapid development on the wild areas of the state. The second piece showed a small cornfield being converted to a housing development, based on an actual site not far from my house in that time. I had shown this piece in one of the WinterArts shows, so I let them know this up front, but I was told it was still desired for this new show, so on a day when it had ceased raining for a few minutes I moved it to my car. The person in charge of the show wasn't around last time I was there, so I kept it in my car until today, when I finally got word that they did want to include it. Before going to work on my ongoing coloring project, I got the piece from my car and brought it inside. With that settled I turned to my ongoing coloring project, but I'll save that story for another post. 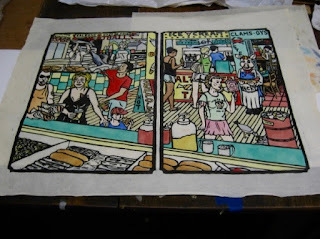 With the coloring done, I packed up and headed down to Belmar. 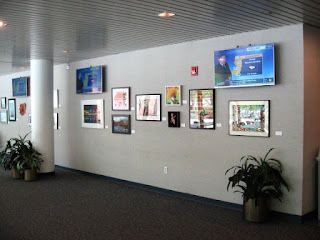 We had gotten word that the show that we had in the nearby corporate space and been picked up and brought back to Belmar, and that we needed to come get our pieces as soon as possible. 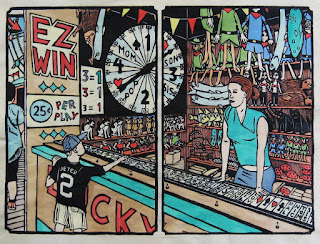 What I had in that show was my boardwalk Wheel Game print, so I took advantage of another rare dry day and picked it up and brought it home. I expect that there will be events linked to this Great Earth show, and when I learn the details I'll post them here. When I woke up this morning I was hearing lawnmowers, like every Wednesday. That told me it wasn't raining at the moment as expected. Later I learned that the rain had already passed through and out to sea. Still, we had gotten all the planting work done yesterday, so I had today available for art. On the way to the Studio I stopped in Belmar to update Rebecca on why I hadn't yet posted images from last week's guest visitors. 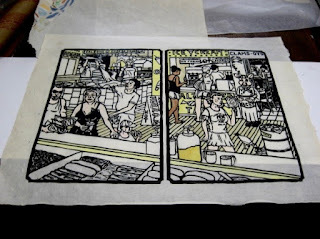 While there I learned that my woodcut class now has a second sign up- it looks like the class will be happening, and with three weeks before the starting date, maybe we'll get more. I was told that this new student found out about the class doing a google search for a woodcut class. Later at home I did a similar search of woodcut class NJ and there was my Belmar class on the first page. I don't have a lot of competition for woodcut classes. 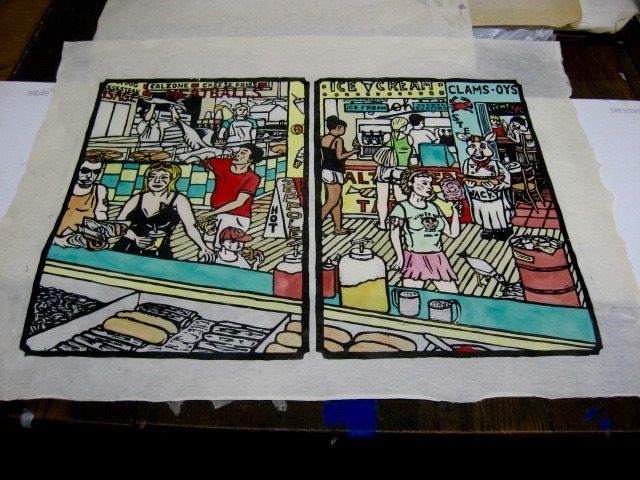 Meanwhile, work progresses on the boardwalk print coloring. Late last year my customer mentioned the possibility that she might come up this way for a spring visit, but a more recent e-mail has her thinking winter again. Still a good idea to get this done and be ready whenever she's ready to claim it. Added some blues today, as well as touching up lots of other colors. Don't know if I have enough black and white to make all the grays needed for the pizza ovens, ice cream machines, and the huge sausage and peppers grill in the foreground, though I did color the gulls and some other small gray things. 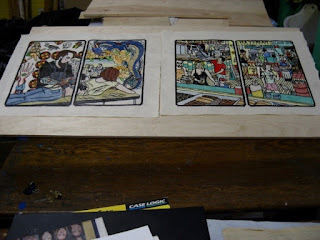 In fact, everything but those large metallic things are done, so one more trip may be enough to finish this job. Spent yesterday at the Seafood Festival and mowing the lawn, a sunny summer like day. When I was shaving this morning I noticed that I had gotten a bit of sun on the areas around the collar, making me literally a redneck. Luckily, not painful. Today, on the other hand, was mostly pouring rain, so no danger of getting a further burn and a good day to go the Studio and get more work done. As you can see from the above photo, the greens started showing up today- that big counter in the foreground, the exteriors of some of the food places across the boards and a few other details here and there. Really makes a big difference. For the moment I skipped over some gray tones that I would have done before the big cool color sections, but I need more of the paints that go into making the grays I need, so that will have to wait for another day. The heat wave finally broke today, not that it made much difference for my plans. I ended up in my basement Studio, always a cool place this time of year. Just had about an hour to spend today, but I made the most of it. A little more brown, and this time some oranges and pinks, and then some of the reds. The range of intensity is broader now, even if the value and temperature range isn't much different. Some of that will show up next week. Tonight something newish happened in Belmar- a critique group. 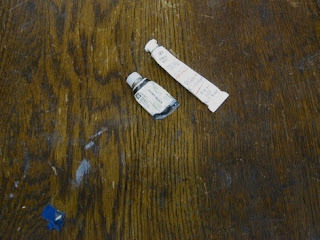 We used to have one years ago, an off-shoot of the our ongoing group at the Studio, but it was always a struggle get people to come, perhaps afraid of having their art criticized, and when the organizer moved away, the Belmar group died. The group that meets in our Studio was very regular, not even missing a meeting around Hurricane Sandy, but we've missed a few months in the last year, and Molly is just refusing to come lately. The last two meetings that I scheduled I was the only one who showed up with art, so I didn't bother this month. So that there's one in Belmar came at a good time. It was organized by some of our photo people, but it was made sure that it would not be a photo group. 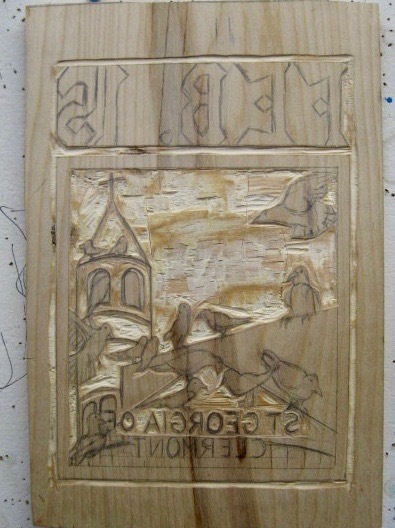 It made sense to me to bring the latest saint block, a piece in progress, if for no other reason to show the group the advantage of bringing work in progress to a critique group. 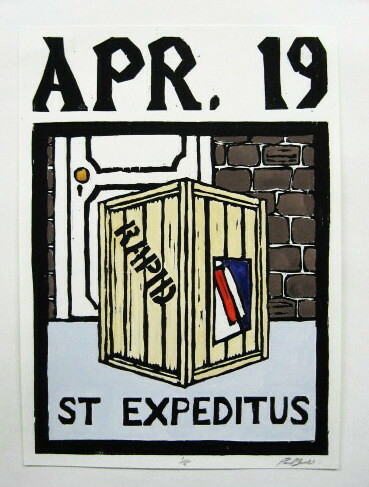 However I did want to add the date at the top first, so this afternoon I pulled some old saint prints so that I could copy the traditional type faces used, and spent part of today's Studio session adding those letters and numbers. The first part of the evening was spent establishing the principles of design, I guess so there would be something to talk about. Old hat for someone like me, who handles critiques in my college classes, but maybe not for the other artists. Besides the organizers, we had 4 artists show work, only one of whom was a photographer. A policy was established that nothing would be said about the works until after everyone had a few minutes to look at them, though in my case there were many questions since many of those present had no knowledge of printmaking and were confused about the idea of things being backwards. Once people realized what they were looking at they liked what they saw. Some people brought up the idea of balance, which was seen in the birds, and in the text. I pointed out that more will come with color and promised to bring the finished one to a future meeting, as this is being planned as an ongoing group. The past two days have seen record temperatures, well above normal for this time of year, and my apartment generally runs 10 to 20 degrees above the official temperature, even with my air conditioner on full. This time of year the simplest solution is to go the the Studio. The basement there stays nice and cool, so it's a good time to work on these boardwalk prints. Did a little more on the block drawing for the new saint (story will be in my next post) then moved on to the coloring of the food print. Had only about an hour for this one today, but some progress was made. Stayed in the same color range, so more yellows and light neutrals, recolored some skin tones. Maybe next time there will be some more intense colors. 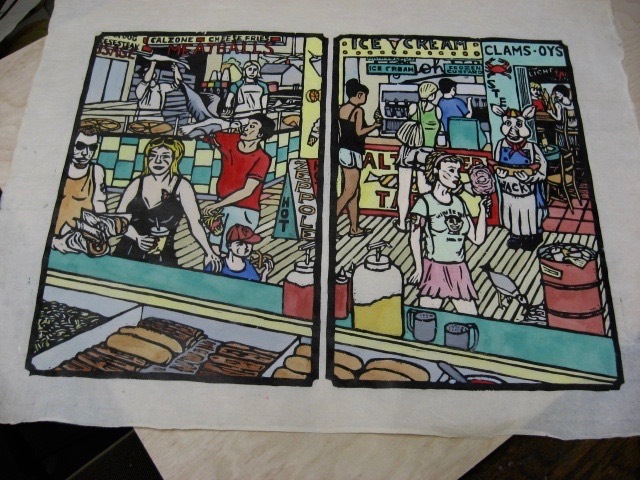 With the reprinted tattoo boardwalk piece now completed, time to move on to the second one. It's been a week since I finished the last one, but I had a lot of other things I had to do in between. And more to go, but I wanted to get going on this, and Mondays tend to be a good day to be in the Studio. 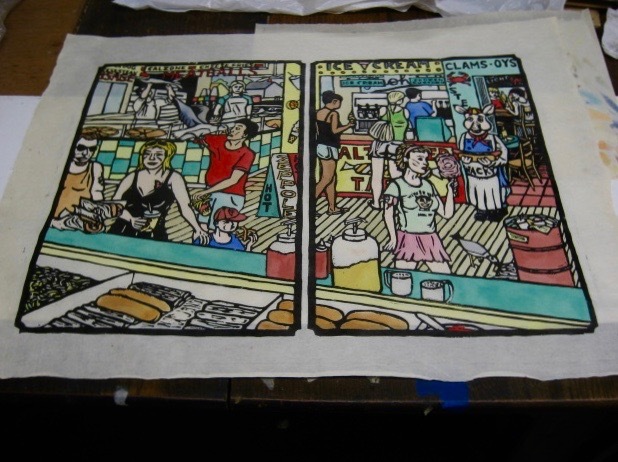 Brought a good copy of the boardwalk food print to be my guide. Followed my usual process, started with pale neutrals, skin tones, yellows. Many of the colors I needed were in my collection of prepared mixes, so I didn't have to waste much time trying to figure out what the colors were and how to make them. Still a long way to go, but good progress today. My latest coloring of the boardwalk tattoo print was almost done. Today I went in and did some touch-ups of color. 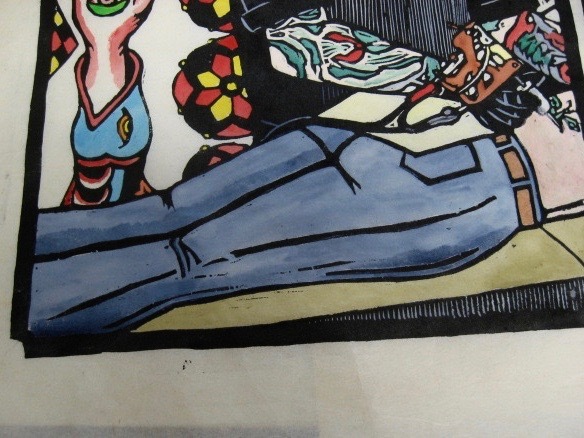 The biggest thing was on those jeans shown above, adding some indigo "shadows" to give more illusion of form. Other minor touch-ups were done in other parts of the print. At this point I'd say this one is done, though I'll give it a careful examination next time I go in. 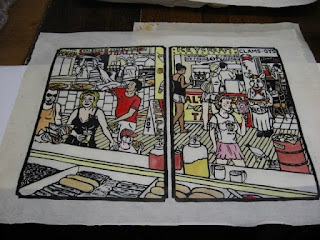 Unless I discover something unusual, the next thing I color will be the second print that Jenny has placed an order for. 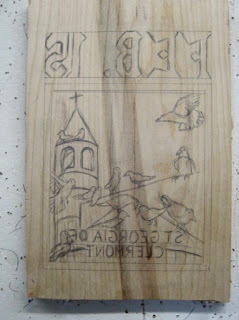 My other task today was working on the next saint print, the one I started sketching last week in Belmar. I had filled a page in a sketchbook with more bird images, and today I started sketching some of those birds on the block. 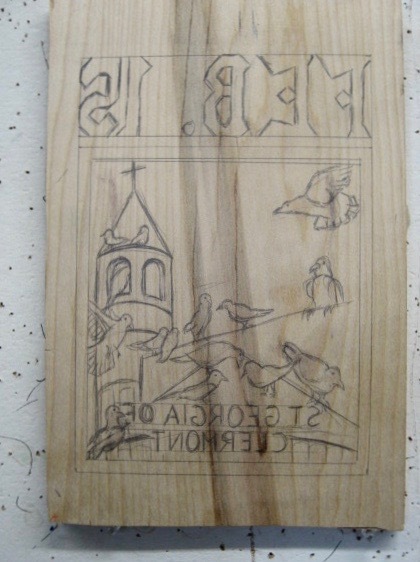 This brings me to 15 birds on the church roof and other architecture, which should be enough to make the point. Also made a few slight adjustments to the building. I'll look it again in a few days, and if nothing else seems to need changing, I'll move on. One thing that has been bothering me about this saint is the lack of verifiable information. This is a problem with a lot of saint biographies, especially the older ones. The Butler's book that I have always used even regularly states that the information they are telling us is at the least not reliable, and sometimes known to be reworked from other stories- mythology, etc. 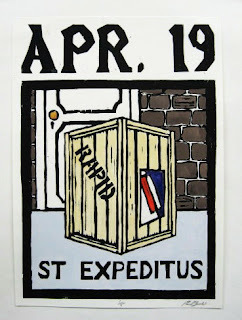 They even advance a theory that one particular early martyr, St Expeditus, may have been nothing more than a mailing label confusion. The edition of the full unabridged set that I own is copyrighted 1962, has nothing about St Georgia, which could just mean she was canonized after that point. (thousands of saints were) The set I had access to in the SIU library (when I started the series) was from the 80's, and I believed that the set at my local public library might be that same era. So maybe that edition has more on St Georgia and stopped by on the way home to see what I could find. Not in that edition. And it seems like the publishers have stopped producing the four volume version. Ones from recent years have cut back to one saint per day, versus the thousands listed in the earlier editions. That may be enough for some people, but not for me. So far all I've found online is a few sentences of biography on one site, and the rest only give me a name and a feast day. If I find nothing else, I'll do the print based on what I have, but I'd much rather have a more authoritative source, or access to the source that the web pages are referencing. 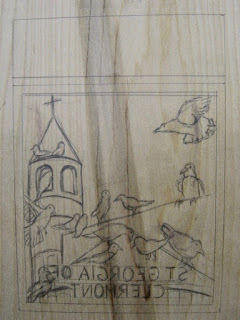 If I can't get that soon, I'll add the feast day I have seen and start cutting. As I mentioned a few days ago, I agreed to be part of a show organized by the Belmar Arts Council and held in a corporate gallery space in my current hometown of Wall. Someone I knew had questions about upcoming shows, and since I had nothing else that I had to do today, it seemed a good day to check it out and find out more. Got the address from the BAC site, looked up the location/directions on my computer's map site, and took a ride there in the early afternoon. Even with directions it wasn't easy to find- signs around this corporate park are misleading or non-existent. Not a huge show- about 15 to 20 pieces were accepted. The space is actually a large corporate dining hall, with all the art on a long interior wall opposite a large wall of windows to the outside. The problem with that is that even on a not particularly sunny day like today you get major reflection on the glass in the frame, especially when you try to see it/photograph it directly. Luckily I didn't need to photograph these works for anything. Just needed some general shots for the BAC blog, and I was able to shoot mine (below) from an angle to eliminate the mirror effect. Got some errands done early today and decided to get up to the Studio and take care of some big things. One of the biggest color groups on this tattoo print is all the blues and I left those until the end. Did a few little bits last week, but today I would take on the rest of it. In the right side panel, the deep background includes some sky and some ocean, both relatively small pieces of the composition. Surrounding the dragon all the way around are a bunch of bubbles. (smoke, air, I have no idea what they are, just something I found in other vintage Japanese dragon images, but liked the effect) As with the official prototype, went with a wash of pthalo blue. As for the dragon, in my initial color study of the first proof I had started with a green dragon, but didn't like the color balance for the whole thing, and redid the proof with deep ultramarine blue. 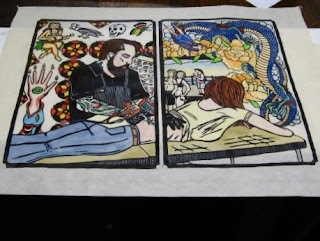 (research had shown that this particular culture had a variety of different colors for dragons with various symbolism, so the blue was logical) Due to the challenges of watercolor and this delicate Japanese paper, coloring the dragon today was a complex task, taking almost 2 hours, filling in each scale one at a time. Really ties the whole composition together. 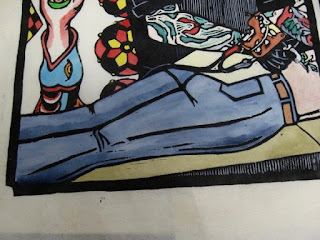 The left panel had blue things too, but simpler- parts of the fish head (with the human hand emerging from the mouth) and the jeans on the woman being tattooed. For the latter, mixed a bunch of blue (a mix of indigo and ultramarine, and bit of white) and put it down as a base. After this has thoroughly dried, I'll go over it with some washes to add shadows. So a few touch ups will be coming, but otherwise this print is about done. 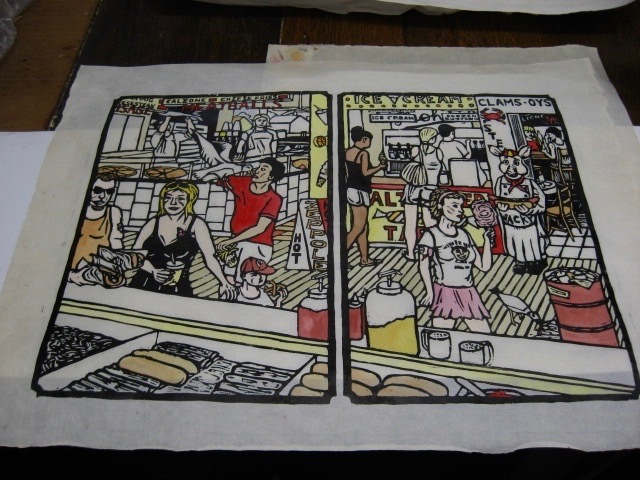 Once this one is finished I can move on to coloring the other boardwalk print I have an order for. The other thing I did today was take advantage of my large studio table to go through the large pieces I collected from my Intro class last week, and will need to return this week. Didn't have the official grading sheets with me, but mental notes made today will speed up the process for when I do the official grading later this week.